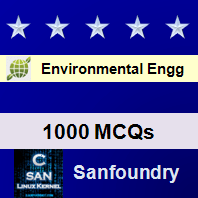 This set of Environmental Engineering Multiple Choice Questions & Answers (MCQs) focuses on “Various Other Filters”. 1. In which type of filter, water flows in upward direction? Explanation: Up flow filter is a rectangular or round shape filter in which water flows in upward direction. 2. State whether the following statement is true or false. The up flow filter is used in domestic water supply. Explanation: The up-flow filter is not used in domestic water supply because sudden variation in pressure breaks the sand bridge and cause the bed to expand. 3. In which type of filter, the filtration is done in two opposite directions at the same time? Explanation: In Bi-flow filter, the filtration is done in the opposite direction at the same time. It is divided into single media and dual media bi-flow filter. 4. Which material is provided for the down-flow bed in dual media bi-flow filter? Explanation: In dual media bi-flow filter, coal sand is provided, If the sand is finer than that provided in rapid sand filter, excessive amount of sand will rise into coal bed and sand will become coarser. 5. The rate of filtration of a Micro-Strainer is __________ litres / hour. Explanation: The rate of filtration of a Micro-Strainer is 50,000-80,000 litres per hour. It cannot remove color and other finely divided particles. 6. Which material is provided for the up flow bed in dual media bi-flow filter? Explanation: Sand is provided for the up-flow bed in dual media bi-flow filter. The quality of effluent obtained from up-flow bed in dual media bi-flow filter is inferior than that of the mixed media filter. 7. Which device is used for screening stored water which do not contain microscopic sized particles? Explanation: Micro-Strainers are stainless steel wire cloth that is used for screening stored water that do not contain algae, plankton and micro sized particles. 8. What is the diameter of drum of a Micro-Strainer? Explanation: The diameter of a drum of Micro-Strainer is 3m and it is 3m wide and single unit of it can deal with about 50,000-80,000 litres/ hour. 9. What is the thickness of a layer of a diatomite filter? Explanation: Diatomite filter consists of a layer of diatomaceous earth, having a thickness of 3mm supported on a filter element called the septum. Explanation: The diatomite is applied on the septum at the rate of 300gm/m2 to form a precoat of filter media. 11. Consider the following statements regarding diatomite filters. 1. They are not used for water having high turbidity. 2. They are not suitable for municipal water supplies. 3. They are not used for temporary and shifting camps. Which of the above statement is/are false? Explanation: The diatomite filter is useful for temporary and shifting camps because they require less space, are lighter in weight and are more mobile.